The chewing surfaces of our teeth are not flat, but have many hills and valleys called pits and fissures. These pits and fissures are so tiny, deep and narrow that not even a single toothbrush bristle is small enough to properly clean them. This makes for a perfect hiding place for plaque and bacteria, which can eventually lead to tooth decay. Sealants make the chewing surface smooth by flowing a clear material into all those tiny pits and fissures. This can help prevent decay on the chewing surfaces of teeth. 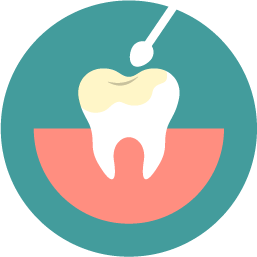 Applying sealants is a very simple, painless procedure. No anesthesia is required. The pits and fissures are cleaned thoroughly. We etch the surface where the sealant will be applied. Etching makes the surface rough so the sealant material will adhere more readily. Next, we paint/flow sealant material into all those tiny pits and fissures. Lastly, a bright curing light is used to harden the sealant. All done! Easy as that! After the procedure is complete, you can eat immediately; no wait time is required.